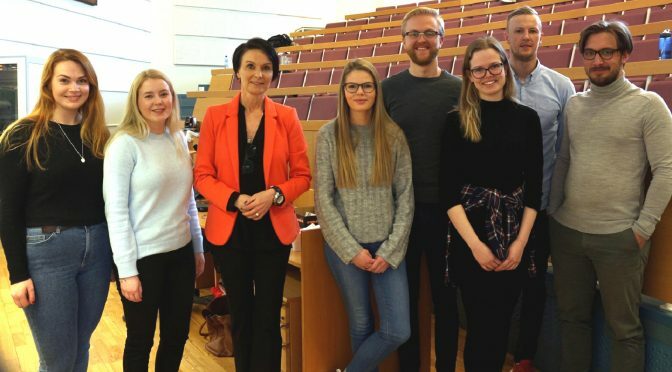 Thursday last week, LogistikkForum had invited Michelle Williams, CEO at Grieg Logistics, to talk about workplace culture, #metoo and Grieg Logistics at Molde campus. Williams graduated from the Royal Norwegian Naval Academy and served in the navy for eight years. She is currently the CEO of Grieg Logistics in Bergen, and has a lot of work experience from the logistics and supply chain industry. One of the topics Williams covered was how graduates better can integrate into the business culture. Many job seekers focus on their years of studies, grades, CVs and experience during a job interview. However, she recommended an alternative approach for the job seeker: «Just go and say, “I can do it!”». Williams said that during the interview, the job seeker should present and demonstrate their personality and competence. Williams accentuated how important it is to ask questions at work. «Ask questions, ask questions, ask questions!» she said. Also, Williams paid an attention to the «Me Too» movement. She said that if someone experienced sexual harassment, one should talk to the management about the situation. If this doesn´t help, Norway has an ombudsman for these kind of situations: Likestillings- og diskrimineringsombudet. She believes anyone can do what they pursue and there are no limits. The lecture continued with a presentation of Grieg Logistics – a national provider of ships services and industrial terminal operations to oil and gas, shipping, offshore, maritime and general industries. The HiMolde students present really enjoyed William’s visit on the international Women’s Day, and asked her many questions after her speech.